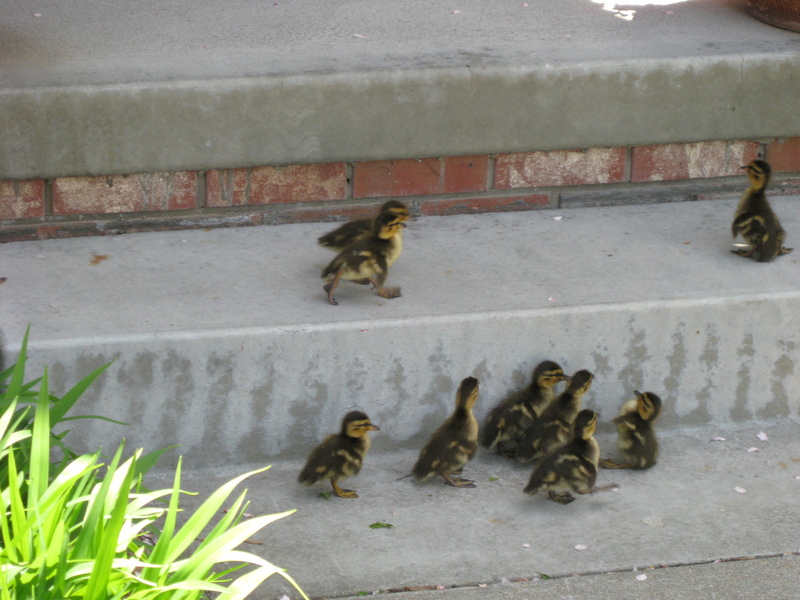 Two springs ago, our neighbor called to tell us we had a dozen mallard ducklings following their mother through our yard! I grabbed my camera and carefully made my way outside to snap a few photos of them! What an adorable sight! 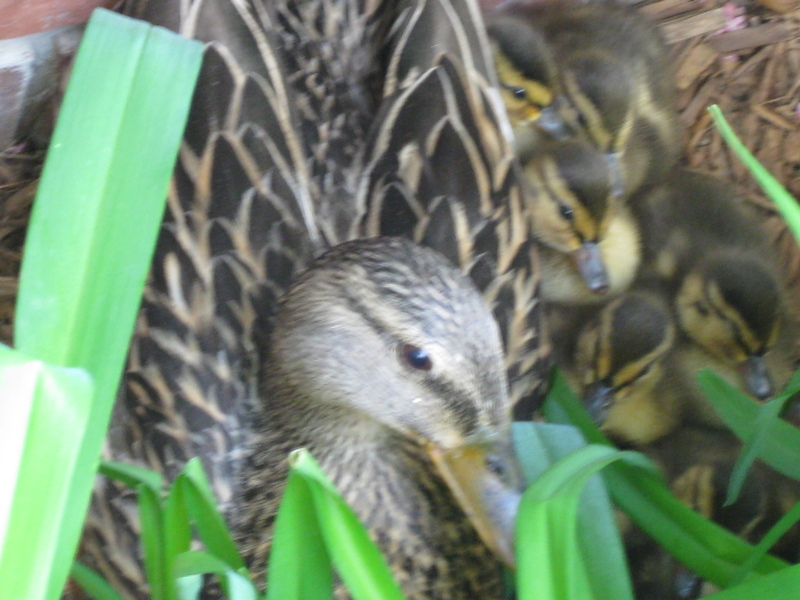 Last spring, a mother mallard laid several eggs under a bush near our garage door. After being frightened by our cars coming and going, she abandoned her nest. We waited a day for her return, then we gathered them up and made our own make-shift nest for them by filling a small bucket with down from an old pillow and securing a light over them for warmth. We researched how to care for them and set a timer to turn them every few hours for weeks and weeks! Once in a while we’d hold the eggs up to a light to see their development and movement within their safe little shell homes. Unfortunately not one of them made it. We were terribly disappointed. Our herculean effort failed to help them survive. 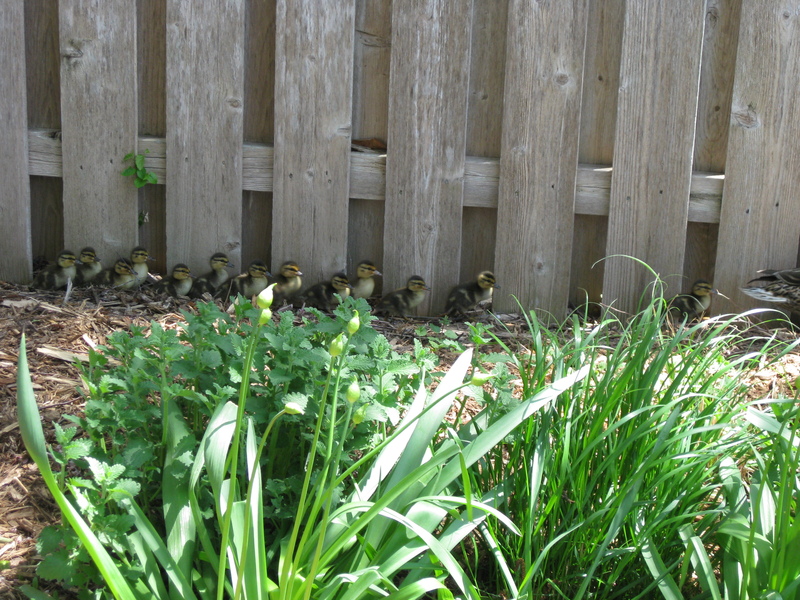 I wonder if that mommy will be back this year. In the meantime, I thought I’d share our pictures with you! Enjoy! Walking back from the mail-box today, in the chilly grayness, I heard the robins chattering in our crab-apple tree. 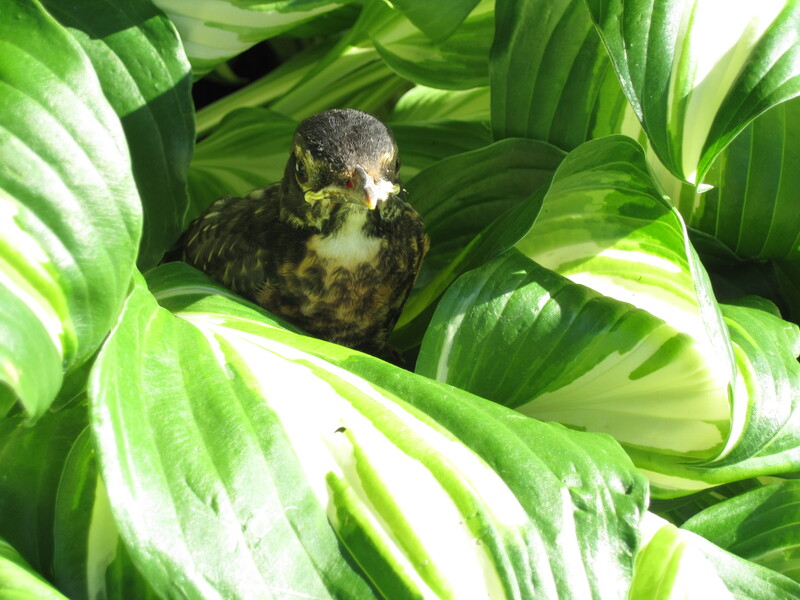 It reminded me of last spring when robins built two nests in it, raising their young as we savored the show. I enjoyed it so much, in fact, that I actually carried our step-ladder out into our front yard, setting it just so, and carefully climbed up to photograph them, horrifying the father robin, perched on the nearby fence chirping short, sharp notes of warning to leave his offspring alone. Of course I left them alone, after photographing their scrawny little bobble-heads! 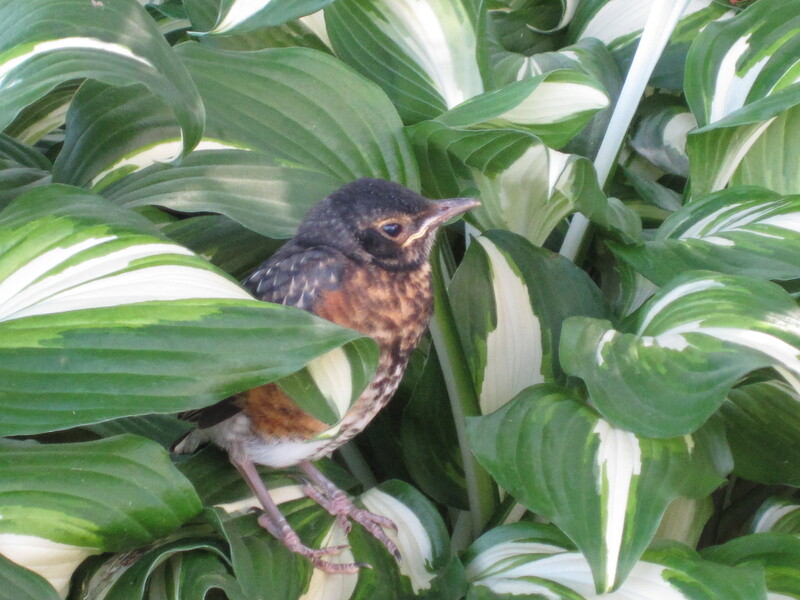 Hearing today’s robins reminded me that even though it doesn’t look like spring, it is undoubtedly arriving and before I know it we will have new nests and new baby robins learning to fly and hunt in our yard. Such joy they bring after a long, bitter winter. Thank you God for new life and hope being birthed around and within me! Here are a few photos that I took last year. I’d love to post the video I took, but alas, to upgrade to have video capability costs sixty bucks and I’m not going to spring for that just now! So enjoy the pics and check out my Facebook if you want to see the video! May it whet your appetite for the coming of spring, for it is, after all, just around the corner! My husband called me to come look out the window this morning. 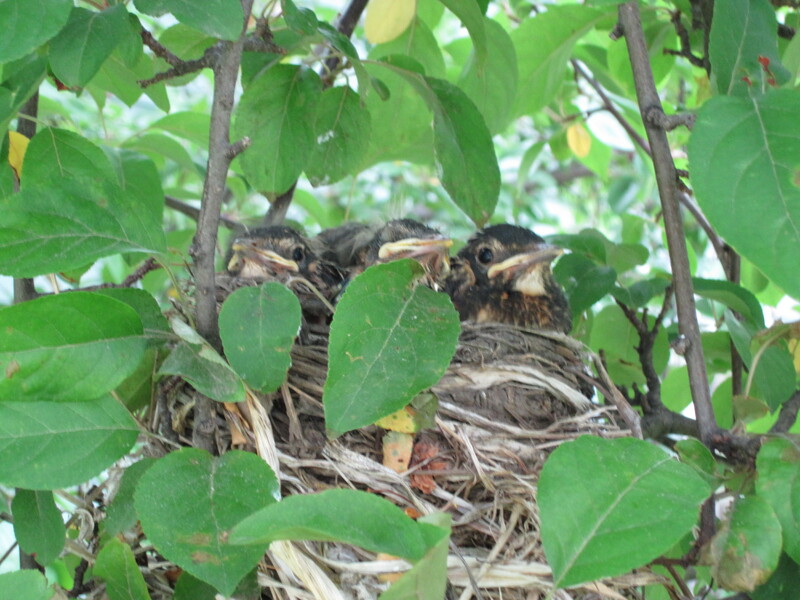 I went into the living room and looked out the window to see our crab-apple tree full of robins! They were feasting on the leftover dried fruit that still clung to the branches. They were enjoying eating as much as we were enjoying watching them! They visit the same tree when the fruit is growing and ripening; they build nests in the branches and push their little babies over the stick-edge to learn to ‘fly by the seat of their pants’. Cardinals, unlike the robins, don’t leave the cold climates during the winter, though why they don’t is a mystery to me! I’m tremendously thankful they stay. 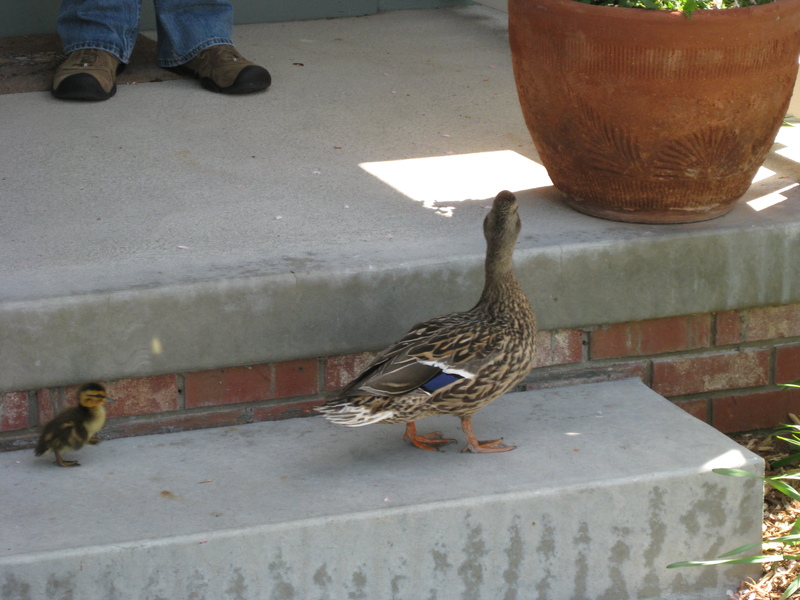 There’s nothing like their bright plumage to bring joy to my heart during the bleak and dreary winter months. I’ve noticed lately that the cardinals that live nearby have changed their conversations. In the winter they don’t sing, they just utter a short ‘pip’ kind of chirp. No matter what I’m doing, if I hear that little glorious sound, my head turns to locate that amazing creature. The other day it dawned on my that they’ve begun singing their sweet sounding songs again, and it delights my heart! Their music moves something deep within me. I can’t explain it, but it’s like a musical balm to my spirit. Over the last several years I’ve become a bird appreciater; a bird watcher, though it happened gradually and quite by accident. Being home recuperating from many surgeries during my cancer process, I began to notice a varied array of birds that frequent our feeders. I’ve observed them for so long, now I even know what time of day I can expect each of them to come! Whether it’s the cardinals or mourning doves, goldfinches or woodpeckers, I’ve come to enjoy their company. Seeing our tree full of robins this morning stirred renewed hope within me. 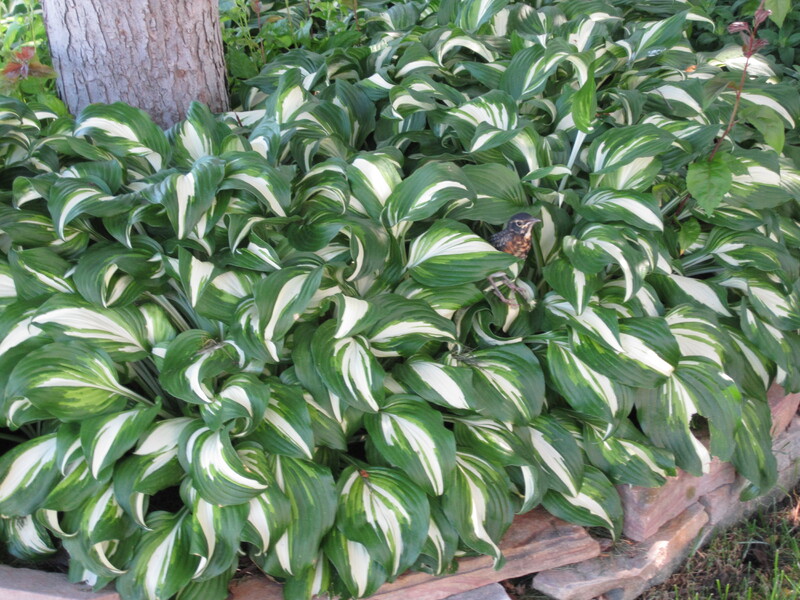 Their return signals the onset of spring! That long-awaited, much-anticipated new-beginnings time of year. Hope has flown back into town in the red breast of the robin. It is tangibly present. I can sense it in the atmosphere. I can feel it inside my being. Because of this and the cardinals’ songs, I can even persevere through whatever cold or snow old man winter may still have up his sleeve, because I know that spring cannot be held away much longer. The robins know it and the cardinals too!